In the Craft Cocktail world, bartenders tend to be creative types. They work hard to build style that is fast, efficient, and pleasant to watch. They work tirelessly on perfecting technique while memorizing hundreds of recipes filled with esoteric ingredients from around the world, and – ultimately – they desire to create a cocktail of their own that will last beyond their lifetime. This is the desire that Bacardi taps into for its annual Bacardi Legacy competition every year: the desire to create something eternal. 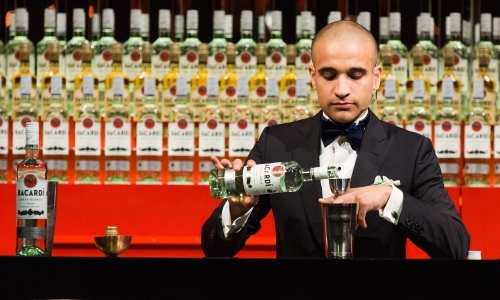 In 2015, the winner of the competition was Frank Dedieu and his Le Latin cocktail. Shake with ice and strain into a coupe. Garnish with an olive. 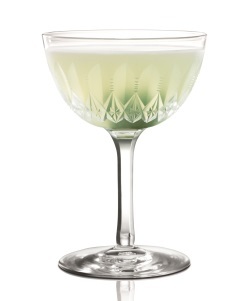 Dubbed by some as the “Dirty Daiquiri,” Frank’s creation adheres to the classic formula of a rum sour (aka The Daiquiri) with some twists to make it his own. I’ll be completely honest, if I had first seen this drink on a menu without any knowledge of what it was, I would steer clear of it – to the other end of the bar if necessary. I’m not a big fan of Dirty Martinis – those gross mixtures of stale, salty water that had the same olives in it for months (or years) on end and flavorless vodka – powerless to do anything more than dilute the flavor of the brine. The mention of the olive brine immediately puts me ill-at-ease. Luckily for me, I happen to know that this is an award winning drink made by one of the world’s most talented bartenders, so I gave it a shot. Guess what: it’s actually good. Yeah, I know, this jimmies the proportions a bit, but US measurements prefer halves and quarters to thirds. Sue me (note: please do not sue me). The lemon and the brine do a nice job of countering each other, with the lemon leading the way and the salty brine finishing the drink. Bridging the gap in between is the incredibly dry Viognier wine – a varietal that isn’t common in the US. Coming in throughout the drink is the sweetness of the sugar balanced with the floral notes of the Bacardi. Le Latin does not live in a perfectly balanced world. The flavors do not all meld together into a singular experience. This drink is a journey. You travel from one flavor to the next in an interesting and enjoyable trip. The simple construction of the drink belies the more complex experience of drinking it. The key to making this bi-polar drink balance on the head of a pin is the Viognier wine. This is not great news for Americans who want to experience the drink. While Dedieu claims that “any” dry white wine will work, I’m not so sure. There a some critical characteristics you need to make this drink work that I haven’t yet found the exact right substitute. You do definitely want to stick to the dry side of the spectrum – a big, buttery Chardonnay would wreck this drink in ways that are probably prohibited specifically in the Geneva Conventions. If you can’t find a good Viognier though, there is hope. Matt Ellingson, sommelier and manager of the bar and wine program at Disneyland’s exclusive Club 33, suggested looking to other dry, crisp wines. Primarily, he suggested a dry riesling, torrontes, or Alsatian Gewurtzraminer. Beyond that, you mix at your own risk. Overall, I have to say I was surprised by how much I liked the drink. Olive brine isn’t really my thing, so I didn’t know what to expect. I would definitely order this drink in a bar that had it on its menu. I probably wouldn’t order two, which is my usual measuring stick for a classic, but it’s refreshing tartness followed by salty minerality is a very nice addition to the cocktail world.